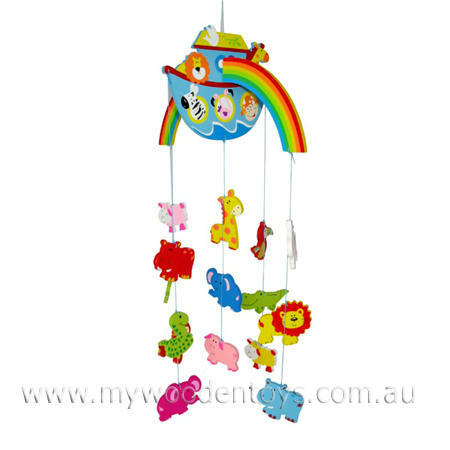 Wooden Noah's Ark Mobile is a beautifully colourful mobile depicting Noah his Ark and a lovely selection of animals. There are Toucans, Crocodiles, Elephants, Snakes and many more all living side by side. The Arks body has a rainbow passing through it and a white dove with an olive branch painted onto the roof. This is a lovely mobile and a lovely addition to any little ones room. Size: Animals are approx 8cm x 8cm tall. Mobile hangs 60cm top to bottom. Material: Wood and Child safe paint. Cotton Hanging. We like this because: "Lovely rainbow."